Our events are a perfect way to engage with Rainier Scholars and support our scholars. Whether it is joining us at our Annual Luncheon each spring, attending our popular Bricks & Books Auction or helping our scholars explore professional opportunities at our Career Expo, your participation will support scholars on their 12-year journey to college graduation and lives of leadership. The Annual Luncheon which took place on April 24, 2018 was attended by nearly 1,200 guests. 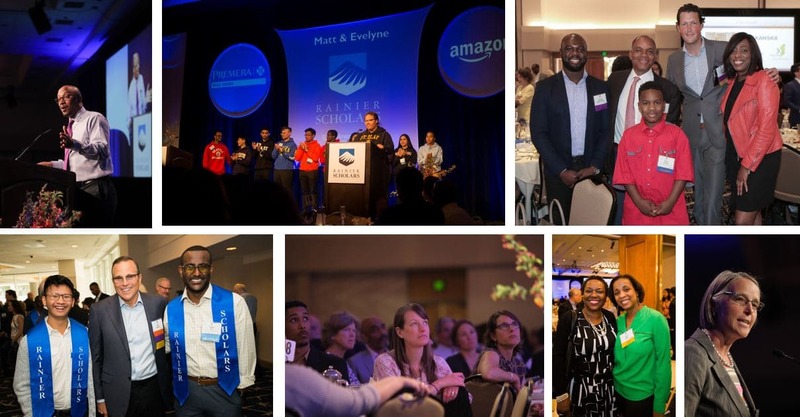 Thanks to the significant support of corporate sponsors, donors and school partners alike, the event raised $1.6 million dollars – nearly 40% of the annual operating budget necessary to serve 700+ students of color on their path to becoming the first in their families to earn a college degree. 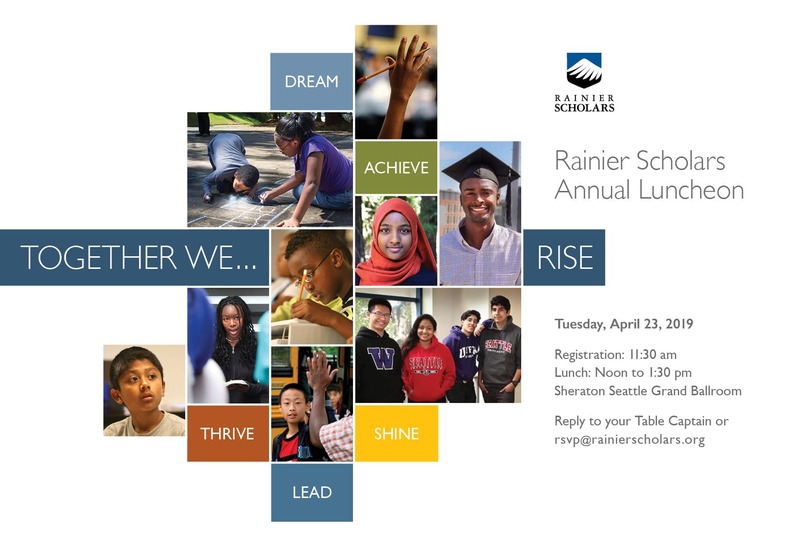 Our luncheon, Charting a Course to College and Beyond, featured a video of two scholars at different ends of the 12-year journey – Ossie, a 5th grader in Cohort 17 who started Rainier Scholars last summer, and Leo, an alum from Cohort 1 who is about to begin his residency as a medical doctor. The video was the emotional high point of the luncheon. Now in its sixth year, our Bricks & Books Auction, co-hosted with Skanska, is held each fall with all proceeds to benefit Rainier Scholars. Join us for a chance to socialize during both a silent and live auction to support our scholars on their 12-year journey to college. The highlight of the night is when our scholars step up to the “mic” and share their personal experience as a Rainier Scholar. For more information, email Bethany Furubayashi, Director of Corporate Engagement, or call (206) 407-2181. Each summer, we offer a Career Expo to connect our scholars to professional networks, explore careers and identify internships/jobs—critical steps as they prepare to enter the workforce. We are pleased to invite partners across industries and sectors to meet our scholars and share internship and employment opportunities. Please email Bethany Furubayashi, Director of Corporate Engagement or call (206) 407-2181, or email Kimberly Petersen, Career Programs Manager or call (206) 838-6675 to participate next year – as a partner or scholar!